Note – do not attempt rescues which are beyond your physical and mechanical ability! 1. The Ladder Shake – if the tree is somewhat flexible – say up to about a foot or so in trunk diameter, you may be able to set a ladder up against it (hopefully into an area where branches meet the trunk for stability) and then climb up the ladder. Just the act of climbing up the ladder and then perhaps shifting your weight forward and backwards while holding on with both hands and feet, may shake the entire tree enough to free your machine. 2. The Big Stick Shake – if your quadcopter is not extremely high, you may be able to find a long branch or other lightweight straight object (see below for examples) and shake the branch from the ground, a stepladder or from a regular ladder securely laid up against the trunk. 3. The “lasso the branch” Shake – For lower branches, you might tie a string (light clothesline, etc.) to a small piece of wood and toss it up so that it drapes over the branch. It will often catch itself up there tightly – or, you can throw it over so that the end with the weight comes back down and then hold both ends and pull for the shake effect! 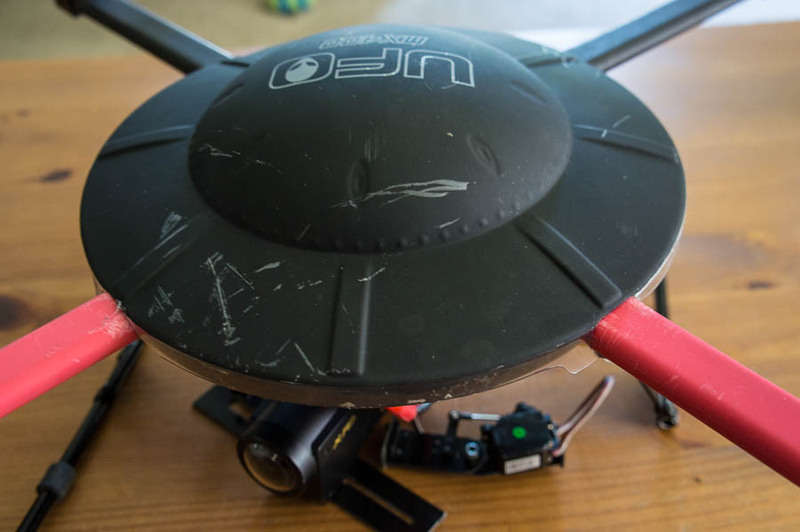 How durable is a quadcopter? When out flying at the local field quite a few people ask about the durability of a quadcopter. After all, if there is any kind of failure, a quad is going to drop from the sky like a lead balloon. An airplane can glide to a landing, a helicopter can auto-rotate, but there is no backup on a quad is something goes wrong. This was put to the test at the local field this past weekend in grand style. In trying to tempt fate, I was showing how well the Walkera MX400 handled in a strong wind and although I am not certain what exactly went wrong, I think something in the auto-leveler freaked out when trying to correct for a strong gust of wind and the copter tilted over at about a 90 degree angle and lawn darted at full speed into the asphalt.